Lots of folks use mouthwash just to make sure their breath is clean and fresh, but mouthwash may have other benefits as well. Which of the Claims are true? The label may say their product fights plaque, bad breath, gum disease and whitens teeth, all at the same time. Truth is that many studies show that rinsing with a fluoride mouthwash reduces demineralization and cavitations of the teeth. That’s a good thing! And, a mouthwash that is antibacterial containing alcohol or chlorhexidine can help fight dangerous bacteria and prevent gum disease. It also cleanses the tongue and cheek area, keeping bacteria at bay. 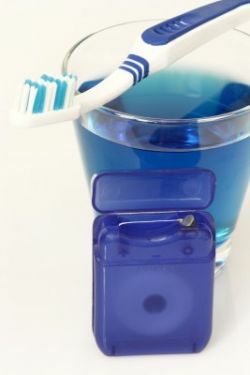 The most important part of oral hygiene is your oral hygiene regimen. Daily brushing at least twice a day, flossing daily and a good rinse will keep bacteria from forming harmful plaque on your teeth. You can prevent bacteria from forming pockets and allowing tooth sockets to get infected and inflamed from bacteria. A good daily oral hygiene regimen, incorporating a mouth wash and visiting Ocean County dentist, Dr. Ron Rotem is your key to a healthy mouth. A healthy mouth is the key to a healthy body. Take time each day for special care of your teeth and oral health and you will see the benefits in your overall health. Call Ocean County dentist, Dr. Ron Rotem and make an appointment to check the overall condition of your oral health today.